October was a rather hectic but very exciting month here at Cupcakes and Couscous HQ. Chaos continued to reign on the home front as renovations went on (we are starting to see the light at the end of the tunnel, hooray! ), my sister visited us from the U.K (double hooray!) and we had a couple of special family birthdays – my Dad, and my youngest James who turned two. He is completely obsessed with all things train related and so it was a no brainer as to what his party theme would be. I thought that this week I would share a few snaps from the day, perhaps they will give you a few ideas if you have a train party coming up. the snacks were served in a train. I painted disposable foil oven trays with blue and green craft paint, stuck black paper circles on the sides for wheels and strung them together with twine. 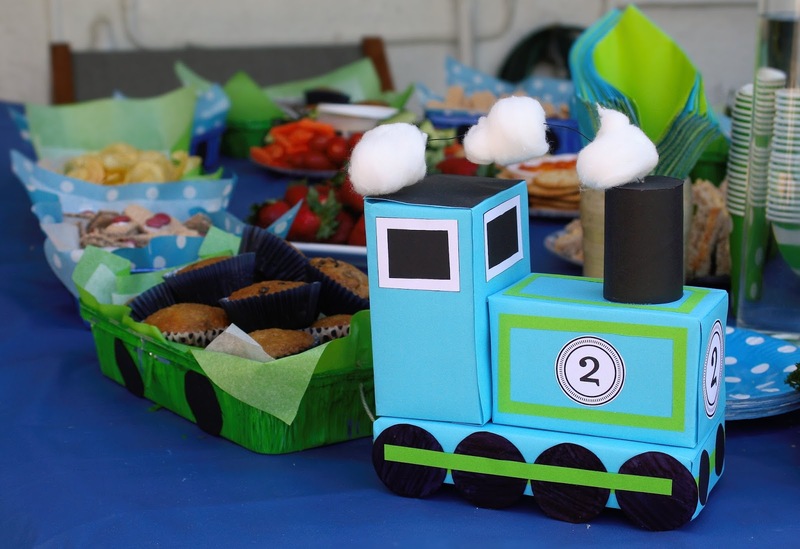 I then used old cardboard boxes to make a train to go at the front (decorated in blue and green of course), lined the carriages with blue and green tissue paper and filled them up with delicious eats. 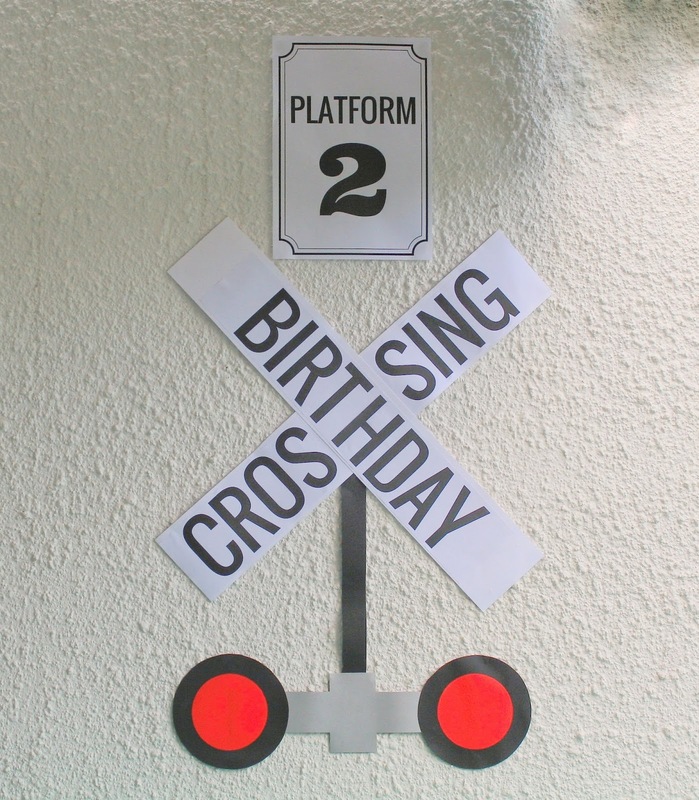 a cardboard “birthday crossing” sign with paper lights underneath, and another sign that said “Platform 2”. “Thanks for chugging by” party packs displayed in an open suitcase marked “Baggage Claim”. the children played pass-the-parcel with train songs as the music. 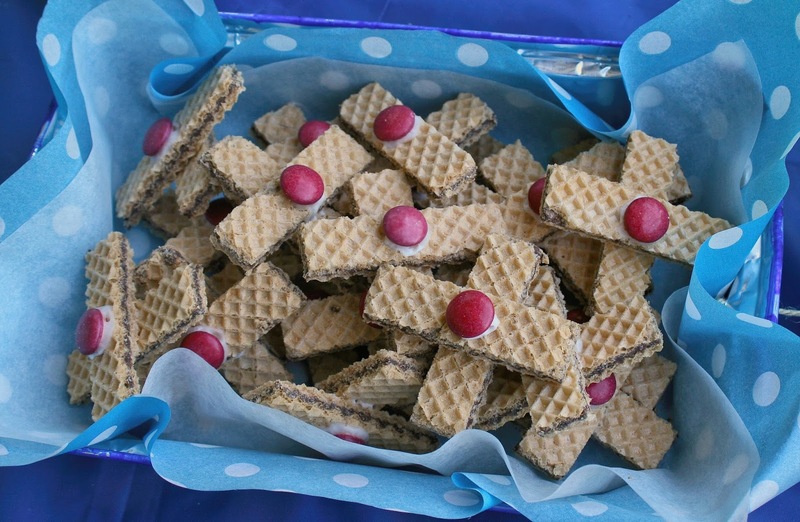 For the food I served a selection of nibbles – fruit and bran muffins, pretzels, crudités, train shaped sugar cookies, fresh fruit, cheese and train crossing biscuits made out of wafer biscuits. It looked rather sweet served up in the train carriages. The main event of course, was the cake. 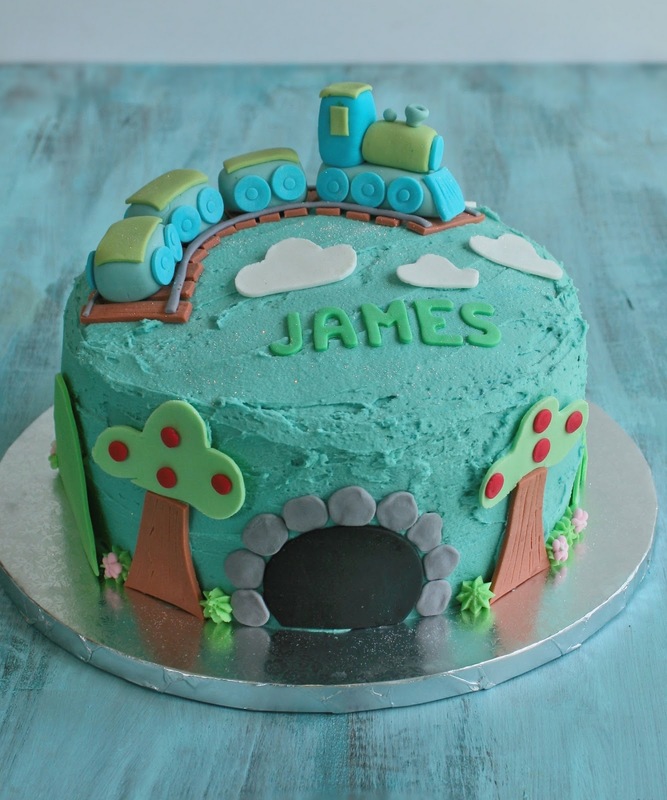 I decided to make a simple round cake decorated with fondant cut outs and topped with a fondant train cake topper. It worked out great as I was able to make all of the fondant goodies a few days ahead of the party (less stress on the day!). I baked the cakes the day before the party, then on the morning of the big day I simply whipped up a batch of icing, iced the cake and popped all the decorations on. I baked two 22cm vanilla cakes. I levelled off the bottom cake to make it easier to stack the other on on top, but I left the top one rounded to give it a “hilly” appearance. The cake was iced with a thin layer of pale blue buttercream icing. 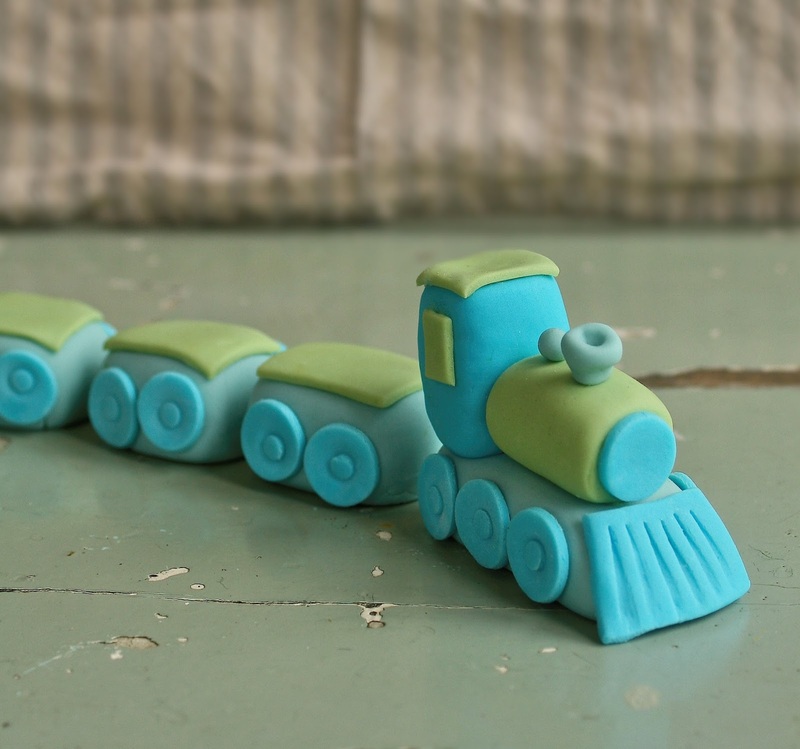 When it came to making the fondant train I referred to this easy tutorial, adding my own touches here and there. 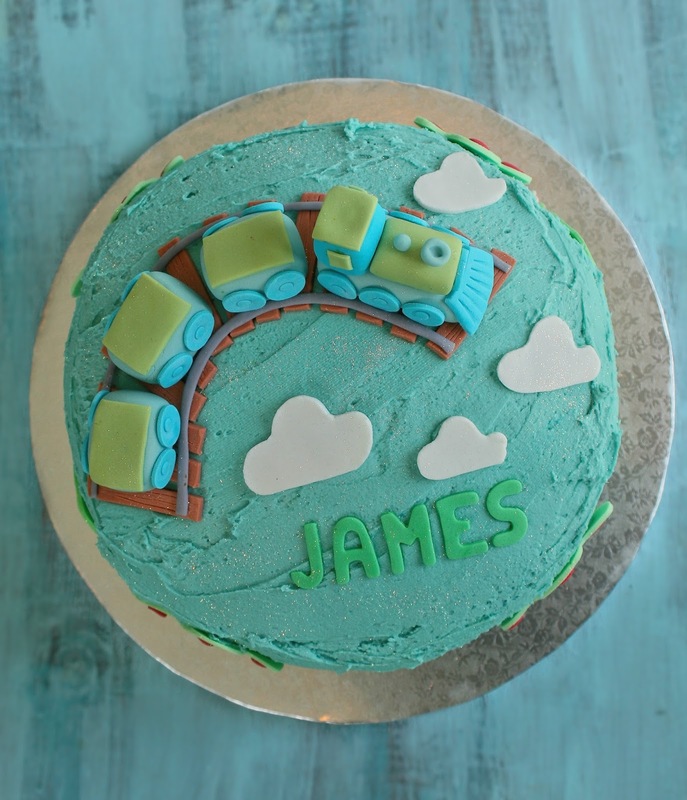 I also used fondant to make the train tracks (I used a sharp knife to score lines into them to give them a more woody look), clouds, “tunnels” with rocks around them, apple trees and hills. I finished the cake off by piping a little bit of green buttercream icing around the base to look like grass. 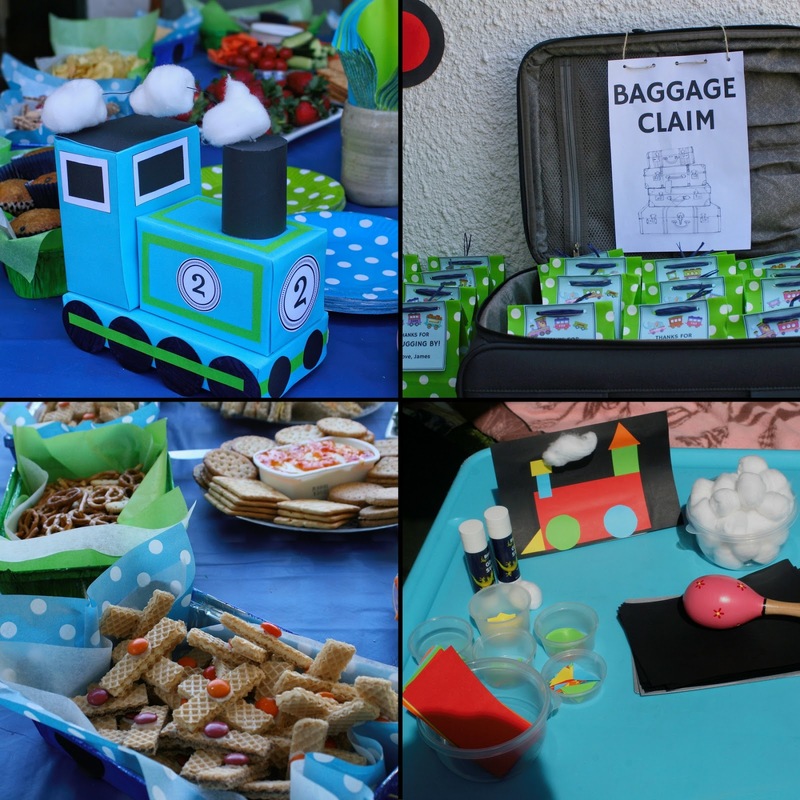 If you have a train party planned for your little one then hopefully this has given you a bit of inspiration. 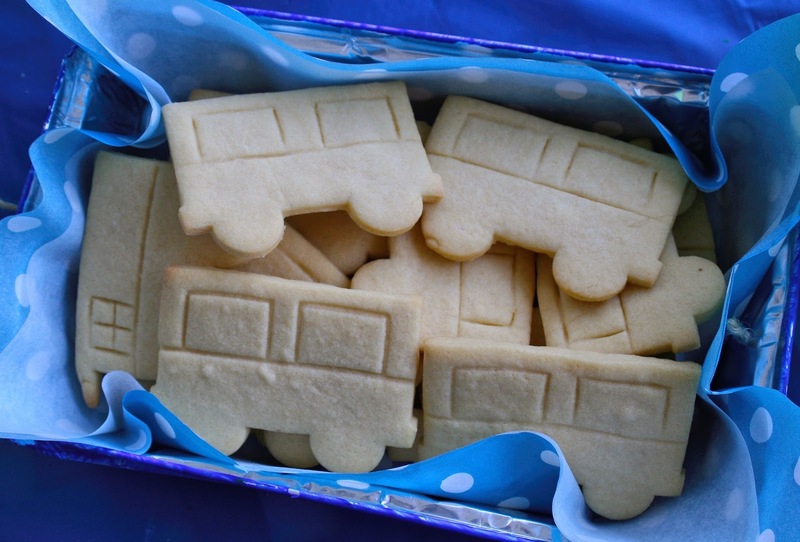 If you have hosted a train party lately I would love to hear about it! It was amazing! So well done! You are so incredibly talented. Love it all! The sweetest little train Teresa! So much work but also the best fun getting creative. Stunning! Totally love the party theme and no doubt everyone had a fabulous time! Very Creative, love the colours you used! Never worked with fondant before, did you buy the colours or did you add colouring to white fondant? Truly a lovery day for your little one! How cool is that! Well done! Now im thinking of cool ideas for my daughter's 3rd birthday in Jan.